When my last book publisher went out of business I looked into the possibility of publishing my own books. I own the rights to several titles, mainly children's picture books which I have written and illustrated myself and often get requests from customers who wish to purchase new copies of old favourites. I was cautioned against doing this by several people who told horror stories of people who had houses filled with unsold books! My house is very small and already over full and although it doesn't cost too much to print a book, warehousing and distribution costs can be high. I had so much enjoyed the business of illustrating and designing books and was reluctant to give up on the idea altogether so I decided to learn as much as I could about desk top publishing and other related computer skills. As an author/illustrator of children's books and being married to a teacher, I was often invited into schools to give talks and run workshops. It soon became clear to me that I needed to know something about book binding in order assist children to make their own books. 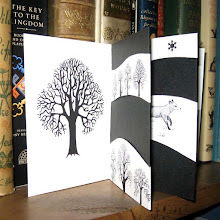 This led me onto a whole new adventure as I joined The Society of Bookbinders and was introduced to the world of artists' books and the private press. I am a great believer in the adage "as one door closes another opens" and now I look back I can see that I would never have found this new interest without the loss of my publisher - which leads me onto Zybooks and Gandha Key. 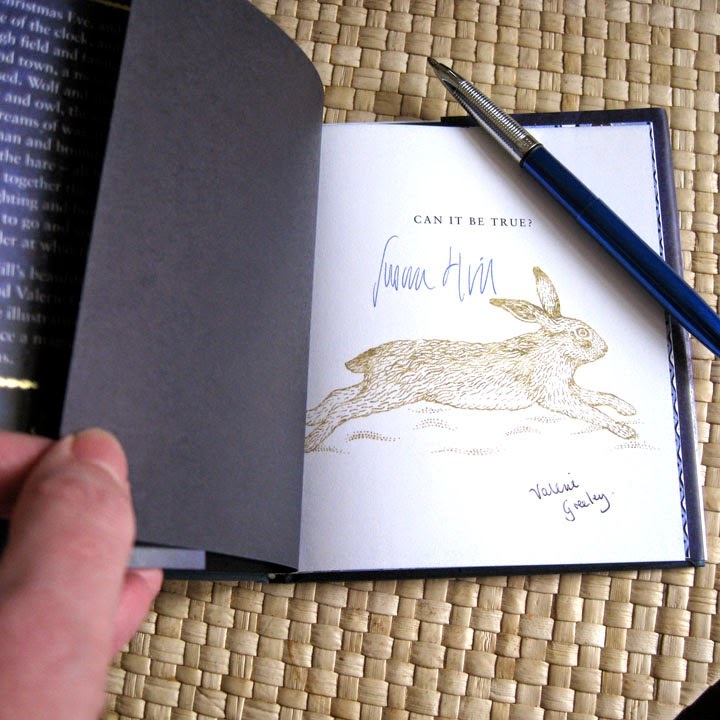 "I studied art and design and printmaking many years ago in the UK and was fortunate to have found some great people at Farnham who taught us to make artist's books, so I developed an interest in them then. In 1999 I visited the London Artist's Book Fair and saw so many wonderful artists' books that I decided to promote them online. 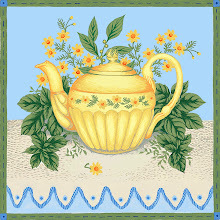 I had just got my first computer and had gone online so it was one of my first internet projects. I contacted people I met at the fair and asked them if they wanted to show their work online"
That was ten years ago and in that time the website has gone from strength to strength and is archived by The British Library. I think she deserves a special thank you for her services to the book arts as she showcases the books free of charge. 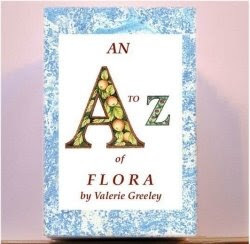 Gandha has very kindly agreed to show two of my miniature "Little Leperello" books and I have been delighted by the response as I recently sold a copy of an A-Z of Flora to a British University Library. 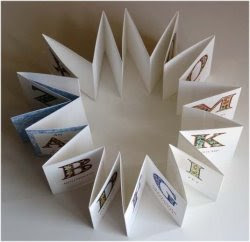 If you are interested in artists' books I am sure you will love her site, it is well worth a visit. Mountains and blue skies at the end of the valley close to where we stayed in the Alps made a perfect setting for a picnic. 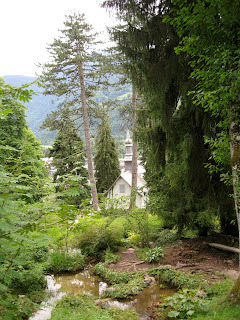 The botanical garden at Samoens in The Grande Massif region was one of the places we visited. This is a most wonderful, heavenly garden which climbs up the mountainside, natural waterfalls and leafy glades make a spectacular setting for this collection of alpine plants. If I could have wrapped it up and brought it home I would have done so! 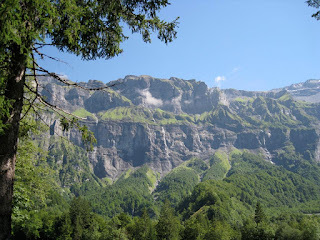 Everywhere you look you can see spectacular scenery which made the climb to the top well worth the effort. We have reluctantly returned home to a very grey and autumnal England after spending some time in sunny France. I will not bore you with my 180 holiday snaps but here are just a few! 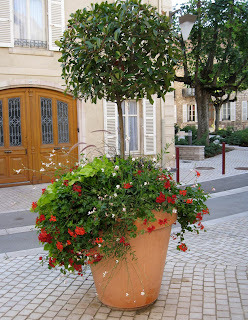 This rather lovely flower display is in Nuits St Georges - home to wine of the same name. Of course it would have been rather rude not to have sampled a glass or two, very nice it was too! 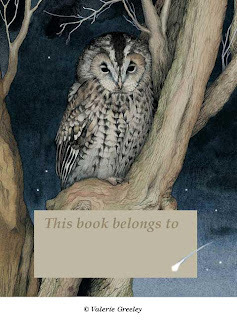 If you have children, or perhaps you enjoy collecting children's books, you may be interested to know that there is a website where you can find specially designed bookplates which you can download for free for non commercial purposes. This may be a good idea for a rainy summer's day during the school holidays. 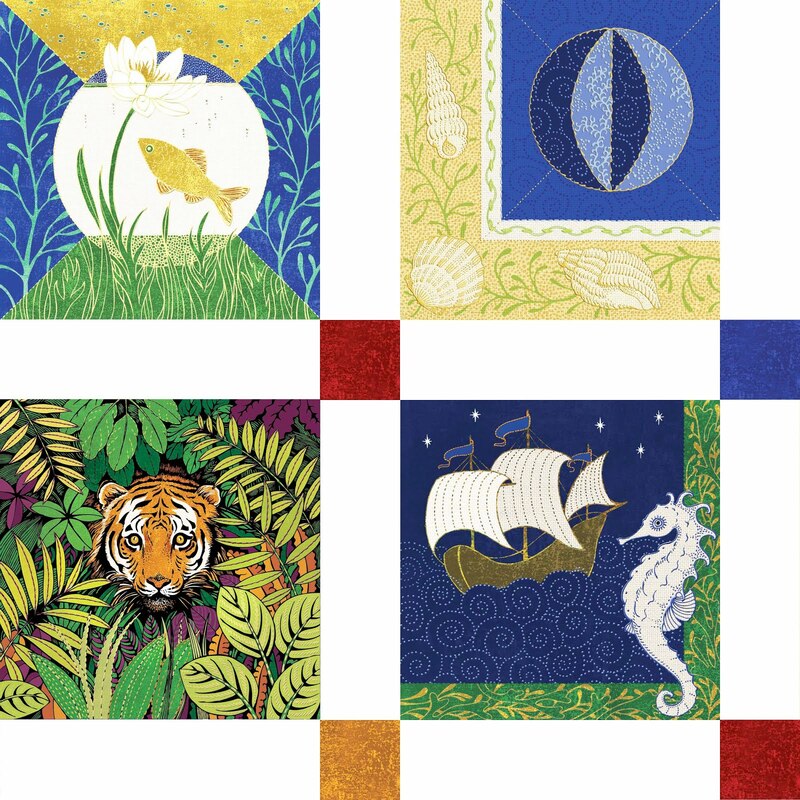 The site was started by Ann Fine who was the Children's Laureate 2001 to 2003. Anne has invited a whole host of illustrators to donate their work to encourage children to start collecting books. 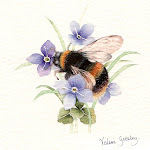 It is called "My Home Library" and features the work of many and varied illustrators such as Jane Ray, Nicola Bayley etc. There are bookplates of all sizes to suit all tastes, I am sure your children will find something to keep themselves amused and busy. 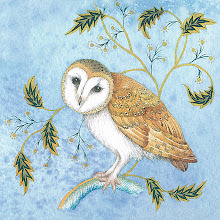 I have donated two designs, one featuring an owl and one a frog. The frog design looks nice printed on a coloured ground and was designed with giving in mind. Many schools have libraries which invite parents and well wishers to donate books and this bookplate would fit such a book. Do have a look at the site, it is great fun and unique. Bringing Home The Evergreens by Pauline Baynes who died on the first of August 2008. 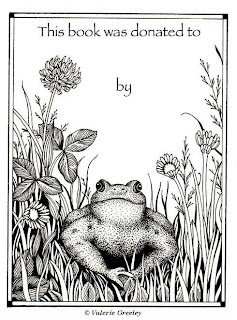 I was very saddened to hear of the death of this wonderful illustrator, who painted such highly detailed, decorative, exquisite book illustrations. She was most famous for illustrating the Narnia novels for C S Lewis, she also painted many wonderful pieces in the style of Medieval Manuscripts. You can read about her life and work here. 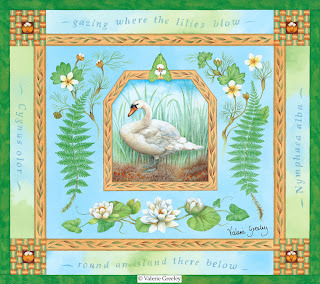 Some of you have commented on the lettering that I have used in the "Illuminations" series of designs featured earlier on this blog. Although I am a great admirer of hand lettering and calligraphy, I do not have the skills to take up a pen or a brush and do freehand lettering. I thought I would let you in on a little secret, this blog is a place to share inspiration and information, so for those of you who, like me, want to include lettering in a piece of artwork but need a bit of help- this is what I did. Firstly, I painted a wash ground in the usual way, allowing two or three subtle shades to mix together, using water based ink. I am a great fan of Dr Martin's ink. (not to be confused with Dr Martin's boots!) Then, I typed out the text on my computer using a very large font, I chose Palatino type, selected bold italic. I then traced around the outline of each letter and placed it in such a way as to meander the words across a curvy line. This was a bit of a fiddle but easy enough, using a good quality tracing paper and a very fine .3 HB lead in my pencil. As tracing puts everything in reverse, I printed the lettering in reverse to start with. So now, I have my letters in a faint pencil outline on my wash ground. I should add that the wash ground has to be perfectly dry. Next, I took a mapping pen with a very fine nib and drew around the letter shapes, then let this dry before carefully removing the pencil with a soft eraser. Next step, I painted the letters one by one with a slightly stronger wash and Voila! Now I know this is a bit of a cheat, but the final result does look better than adding the text at a later stage by computer. Before I close, I must tell you about an amazing calligrapher that came to our bookbinding group to give a workshop. His name is Paul Antonio, if you get a chance have a look at his website, even better, see him in action. He is amazing, what's more, he sings in Italian whilst performing, and I use the word advisedly, his swirls and flourishes! Needless to say that he works without the aid of a computer. If you click on the illustration you will see it more clearly.